From carpet through to laminate, flooring for the home brings a world of choice and with many floor coverings crossing over from room to room, the choice of floor comes down as much to individual style as it does practicality and suitability. Of course, there are some rooms in the home that favour certain practicalities that make one particular type of floor covering the only choice. For example, the kitchen requires a floor that is easy to clean, that resists staining and that can withstand constant attack from water, cooking spills and at times, muddy footprints. While wood and laminate floorcoverings have certainly become more popular and are used by many homeowners to make a style statement, our climate with its long, wet and cold winters, still favours carpet and with its comfort underfoot and warmth retention it is still the nation's favourite floor. There is such a choice of carpet out there that you are only limited by your budget and the look you are trying to achieve. Whether wool, wool-rich or entirely manmade, carpet can be used to provide a neutral backdrop to furnishings and fixtures or for the bold, it can be used to make as much of a statement as any richly coloured feature wall or striking contemporary furniture. In terms of neutral carpets, textures bring an added dimension and give extra visual interest that offsets the rather staid beige. Cavalier Carpets' Woolsack is a classical loop pile carpet that has been given a textural edge with a bigger and more defined loop pile. 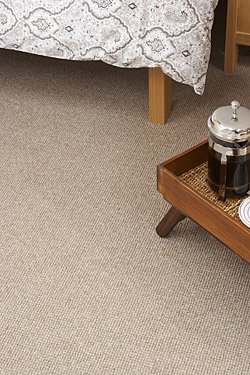 Working with colours such as rice, husk and bullrush, this 100% New Zealand Wool carpet has a natural look that gives the effect of more unusual natural floorcoverings such as seagrass without the drawbacks. Within the realms of soft furnishings and wallpaper, strong floral patterns are making appearances to draw attention and interest, or just to break up natural materials and colours. In a more understated way but no less effective, the same can be achieved with carpets such as Axminster Carpets' Royal Seaton. The soft florals in subdued pinks, blues, oranges and browns in the Calico design add depth and interest while the light mink colourway adds neutrality and helps to blend the 100% wool carpet with furniture and soft furnishings. For the bold and brave, carpet can also be had in strong, bold tones that really add a sense of drama to the room. Great for those rooms with rich, dark furniture, Pownall Carpets' Fenland Textures can be had in rich red, blue glaze and elegance. These strong colours can be used to set the tone of the room rather than just becoming something that works no matter what the style and as such, the wool-rich Fenland Textures collection is great for those wishing to make a real statement. As colour comes back to homes more, there are a growing number of strong shades on offer from most manufacturers and should red or blues be a step too far, there are some stronger neutral shades such as chocolate and coffee browns coming to the fore. Even with this great choice, for some the practicality, almost worry-free nature of hard floorcoverings are making them a great addition and for those wanting a uniform style through their home, the fact they can be used everywhere from cloakrooms to kitchens, hallways and lounges make them a natural choice. However, materials such as stone, wood and ceramics do have their individual difficulties and virtually all require some kind of specialist maintenance throughout their life. By using the flexibility of laminate, the effects of these materials can be achieved without the specialist care so often required and also without the high cost often associated with these fashionable floors. With modern laminate production, manufacturers such as Quick-Step are able to create more and more realistic products in everything from slate, to all species of wood and now even concrete. Great for use in modernist homes and urban properties, Quick-Step Arte Polished Concrete comes in either natural or dark finishes in a large tile format that creates a clean, refined look and hops on the trend for architectural materials in the home. For the more conventional, Quick-Step's range of wood decors ranges far and wide and includes everything from grey teak through to panga, merbau and even white varnished oak. With different widths, lengths and even a floor that is guaranteed for use in the bathroom, there is no shortage of flavours to choose from and with the right choice, the end results are stunning. The trick to getting the right floor is assessing just what you want from it and then finding a style that works with your interior. 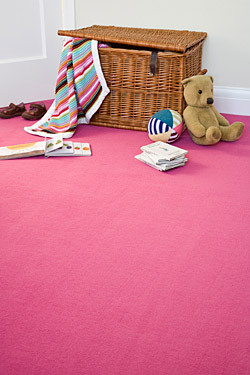 If underfoot comfort is high on your list, then carpet is really the only way to go. However, should you want something that can simply be wiped clean and that will resist the trials of living, then hard floorings are certainly the way forward. Just remember that natural materials may not be as simply maintained as you think and for the easiest of living, laminate is a great start.